Things were jumping in July for Easy Ed's Variety Hour: Three radio shows (which you can download for free from www.easy-ed.net or you can subscribe through iTunes) and live spinning gigs at Primitive Sounds night at River Gods in Cambridge and at the Kim Lenz/Raging Teens/Roy Sludge Trio show at TT the Bear's early in the month. I was also lucky enough to get down to NYC to see the Ray Collins Hot Club from Germany and a bonus nightclub show by Eddie Clendening and the Blue Ribbon Boys. Whew! Anyway, that's the story in a nutshell. 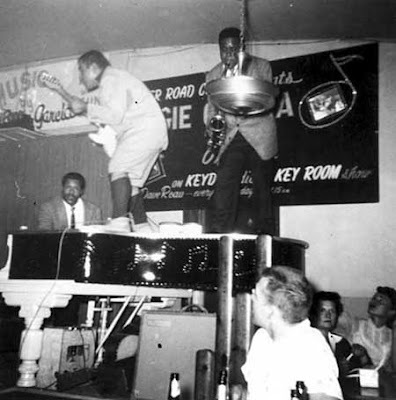 If you listen to the show, bless you! You can get more news about it on the Easy Ed Facebook page. Things are happening and life is good over here. I hope it's good wherever you are. Why? : Best not to ask. Can’t listen live? Visit www.easy-ed.net for information about archived episodes. You can also follow (and send requests to) “Easy Ed’s Variety Hour” on Facebook. 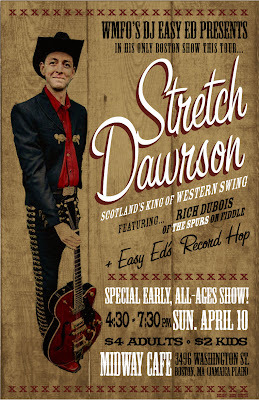 April 10: WMFO’s DJ Easy Ed Presents: Stretch Dawrson--Scotland’s King of Western Swing! With Rich Dubois of the Spurs on fiddle. 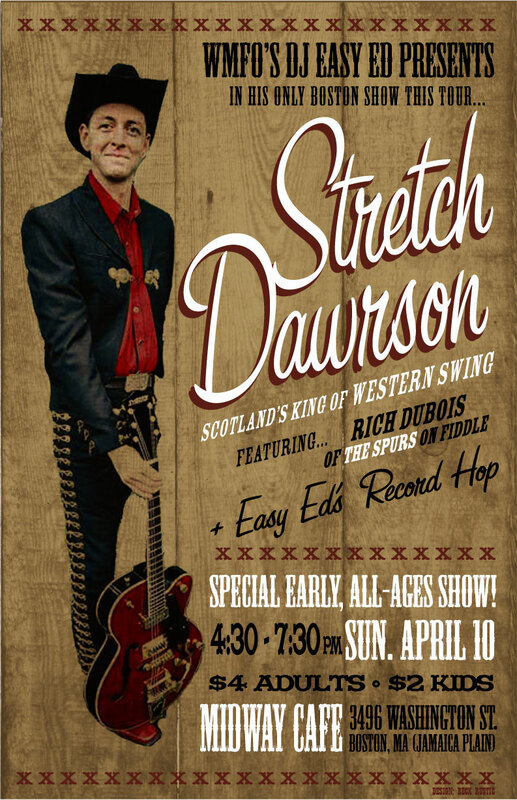 Special early evening, all-ages show.Western Swing from Scotland? You got that right, and Bob Wills, Merle Travis, and Hank Penny would be proud. 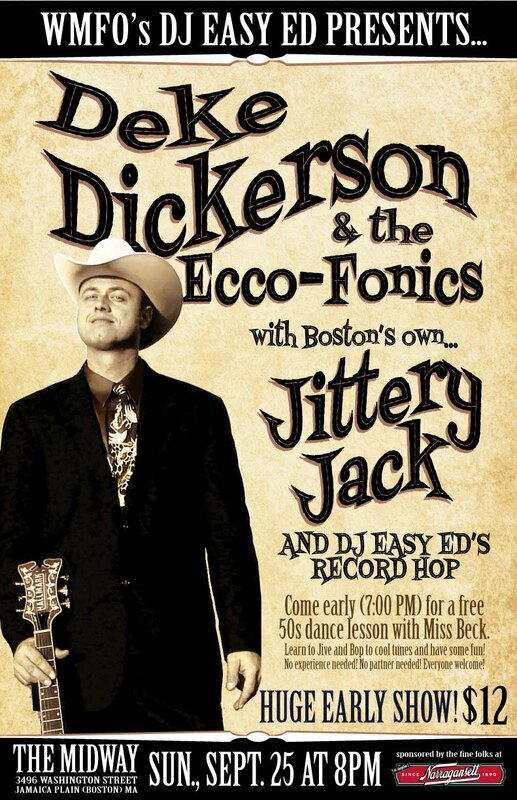 Don’t miss your chance to see one of U.K.’s foremost traditional Western Swing multi-instrumentalists in his only Boston appearance this tour. Calling all lovers of traditional country music, dancers, honky-tonk hillbillies, Scots, the mildly curious, and anyone else who wants to have a blast on a Sunday afternoon and still make it to work on time the next day. All welcome! 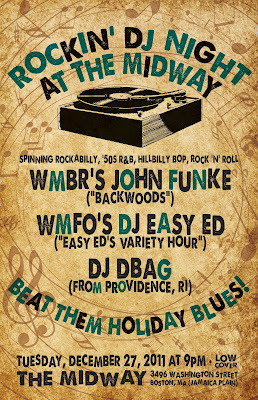 Easy Ed’s Record Hop will be on hand to spin country tunes for the dancers. 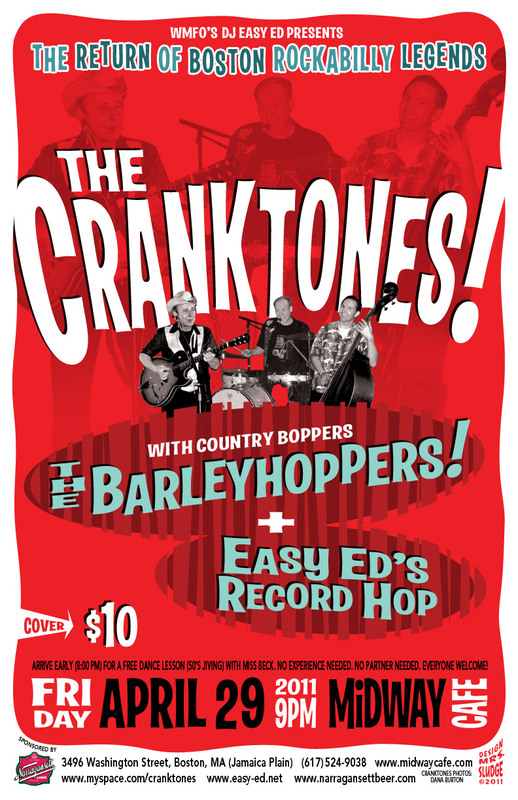 April 29: It’s the triumphant return of Boston’s legendary Cranktones! Don’t miss this super-rare event. They haven’t played in a long time, and no other shows are currently scheduled. 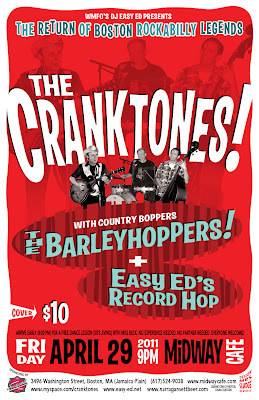 Opening the show, those cool country boppers, the Barleyhoppers. 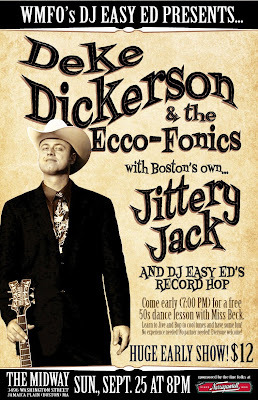 Arrive early (8:00 PM) for a free dance lesson (50s Jiving) with Miss Beck. No experience needed. No partner needed. Everyone welcome! 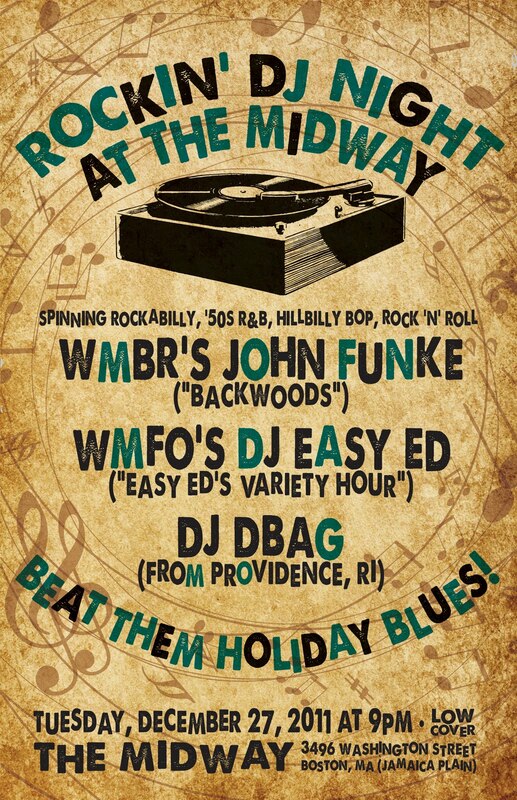 This show will also take place at the Midway Café. 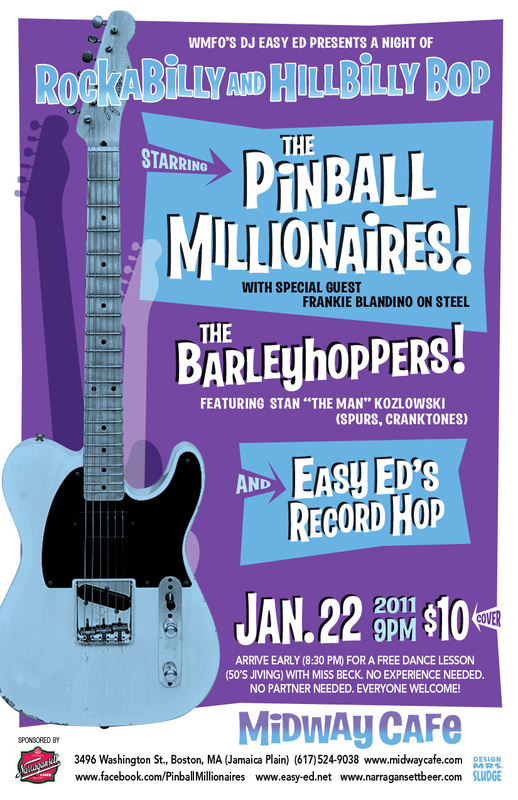 Poster design by Kathy Wade. P.S. Below is a list of what I played on the last show. If you missed the show, you can listen to the archive version anytime. 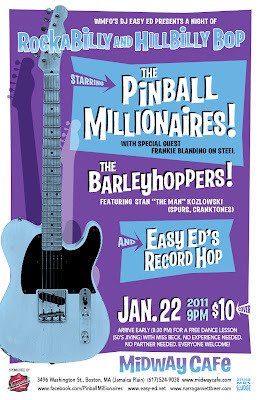 Visit www.easy-ed.net for details. Stretch Dawrson “I Laugh When I Think How I Cried Over You” from n/a – Live recording made in Edinburgh www.myspace.com/stretchdawrsonandthemendingheartsswingband See him at the Midway Café in Jamaica Plain on April 10 (late afternoon all-ages show). High Noon “Don't Have a Heart Left to Break” from Glory Bound CD ALBUM (Goofin' Records) – www.myspace.com/highnoontrio See them at appearing at the Lone Star Round Up www.lonestarroundup.com on Friday, April 1, in Austin, Texas. 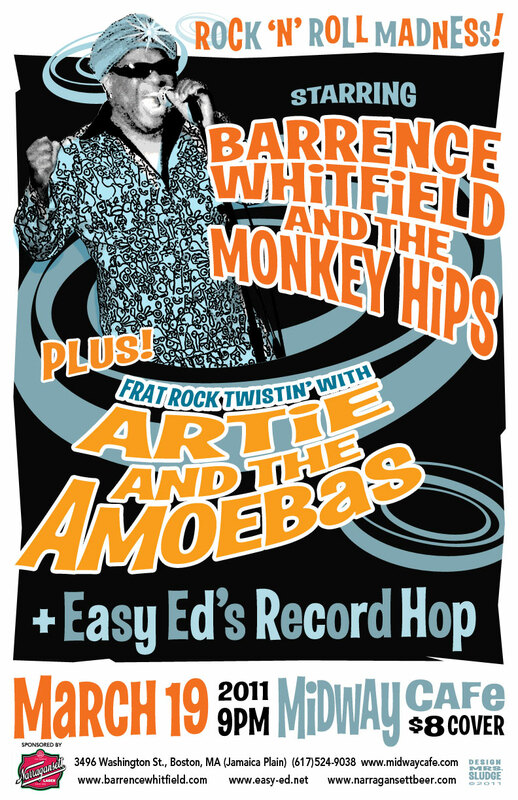 March 19 2011: Don’t miss Barrence Whitfield and the Monkey Hips at the Midway Cafe in Boston! International stars of stage and screen, these guys are ready to rock the roof off as only they know how. 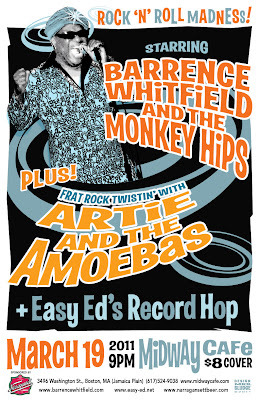 Artie and the Amoebas will serve up a set of Frat Rock Twistin’ to get the night started right and DJ Easy Ed will man the decks early on and between bands. Come on down and move it around.